People United for Sustainable Housing, or PUSH, is a non-profit operating on the West Side of Buffalo to help rehabilitate old buildings and provide affordable housing in the neighborhoods. They’ve had a lot of success — in fact, maybe too much. There’s an interesting article in this morning’s paper about how the work PUSH is doing is actually raising property values in this part of the city enough to start gentrifying out the current inhabitants. With the number of immigrant and refugee communities on the West Side, it’s more complicated than you might expect for them to pull up stakes and move to another, still inexpensive, part of the city. Mark of the Beast, or Big Brother? I figured it would only be a matter of time before this sort of thing started popping up. Given the recent events in Connecticut, it’s a fair bet more schools will be following suit. I’m sure there’s no possible way this student ID/ tracking system could be exploited, abused, or hacked, at all. The best part: its being done ostensibly to get more money for the school district. While the Biblical issues being raised by this particular student may be debated, the privacy concerns seem pretty relevant. 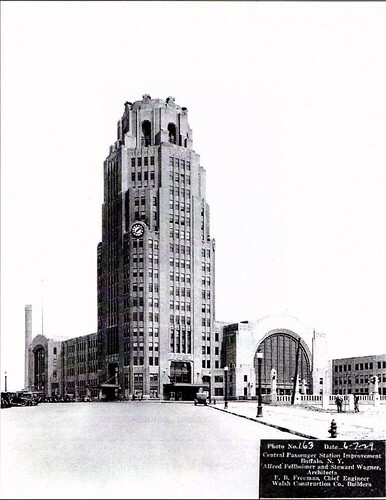 Buffalo’s Central Terminal, abandoned since the late 1970s, was pillaged and its fixtures stripped out and resold. They’ve shown up all over the world, from art galleries to restaurants in Asia. Supporters of the neighborhood recently concluded a fundraising drive to bring at least one of the art deco lights back from an art dealer in Canada. Merry Christmas!